SuccessFactors Human Capital Management (HCM) solutions integrates onboarding, social business and collaboration tools, a learning management system (LMS), performance management, recruiting software, applicant tracking software, succession planning, talent management and HR analytics to deliver business strategy alignment, team execution and maximize people performance. Our solutions are cloud-based, easy to implement and capable of growing with your organization so you can start anywhere go everywhere! Your business needs to move quickly while maintaining the integrity of business processes across cloud and on-premise systems. SuccessFactors provides an open, flexible approach to integrating its cloud solutions that lowers cost, increases speed, and enhances simplicity. 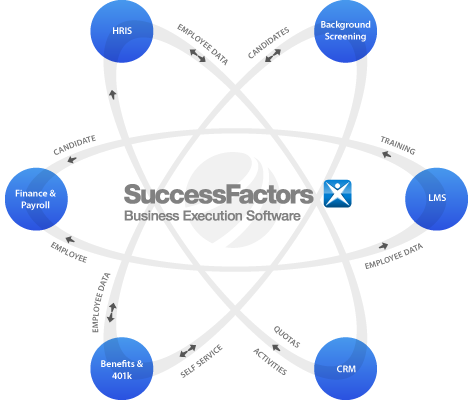 SuccessFactors takes the risk and cost out of integrations by delivering out-of-the-box content (interfaces, templates, connectors, mappings, workflows) for SuccessFactors-SAP and selective SuccessFactors-third-party applications – that are 100% built and maintained by us. Your choice of integration platforms: You can choose an easy-to-use graphical platform to extend, build, and monitor integration scenarios (SAP HANA Cloud Integration Platform, NetWeaver Process Integration, or Dell Boomi for SuccessFactors integrations for People pillar). Flexible deployment options: Integrations can be deployed on-premise or in the cloud. The SAP HANA Cloud Integration Platform can be deployed in the cloud, or you can use NetWeaver Process Integration on-premise. SuccessFactors also hosts Dell Boomi in the cloud for Employee Central or Employee Central Payroll integrations. Rich set of Application Programming Interfaces (APIs): Open, standards-based APIs help customers and partners build custom integration scenarios using SAP platform or any partner platform of their choice (Cast Iron or Mulesoft). Ability to schedule imports: SuccessFactors can help you securely import data to your database without the data being accessible to SuccessFactors, ensuring your data privacy. You can schedule imports and receive regular secure status reports via email. Faster integrations: With iFlows doing most of the work for you, your IT department spends 80 percent less time on coding, testing, and other application integration tasks, resulting in faster deployments. Out of Box Boomi Processes: Several out of the box Boomi processes makes the integration hassle and complex free. These processes are so easy to customize as per business requirements. Powerful Connector: The word “Magic” is best suited for defining Boomi connector for SuccessFactors. It magically solves most of the integration challenges. Solid SuccessFactors API: While most of the integration challenges are achieved through the connector, the API offers even more accessibility to execute complex integrations and access enterprise success factors data by simple SOAP calls. Secure connections: Authorization roles control which users can launch, build, and view integrations and their data and security for data when moving beyond your firewall.